Just as outdoor fireplaces keep you using your outdoor space into the cooler evenings of a Colorado summer night, custom fire pits can do the same. 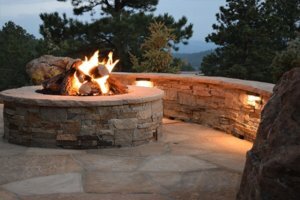 Evergreen Landscape & Design has built outdoor fire pits in many different shapes and sizes throughout the Evergreen Colorado and surrounding communities of Conifer, Morrison, Genesee, Golden and the Denver Metro areas. Outdoor fire pits are truly limitless in their design and can be tailored to any outdoor space. In the landscape design process, we use elements like outdoor fire places and fire pits to create a more outdoor room look and feel. We can create square fire pits, rectangular fire pits, round fire pits, oval, tall, short or pretty much whatever our imaginations can dream up. Often the shape or overall size of a fire pit will be somewhat dictated by the shape of a patio or the overall usable space within an outdoor living space. We mostly construct custom gas fire pits these days, as it is a safer and cleaner alternative to wood burning fire pits. Particularly with all the fire hazards in the mountains of Colorado and the often implemented burn restrictions, custom gas fire pits serve as a safer alternative to wood burning fire pits. Does that cheap Costco or Target fire pit look like something that will stick around in your landscape for many years to come? Buying these prefabricated fire pits is an alternative; however, they will never stand the test of time, nor provide the unique beauty that a custom outdoor fire pit will. The lasting advantages of a custom outdoor fire pit verses a pre manufactured, box store fire pit makes them a great value for any Colorado landscape project when durability and custom look and feel are important. Custom built stone fire pits will be a focal point of any landscape, and help provide the most use of your outdoor living space. Outdoor fire pits provide enjoyment and are the perfect complement to your outdoor living space.